When Bill and Mikki Lukens planned vacations for their family, they had one requirement: “It had to be in the West, because we both love mountains,” Mikki says. Their attraction was so strong, they hoped to retire there. 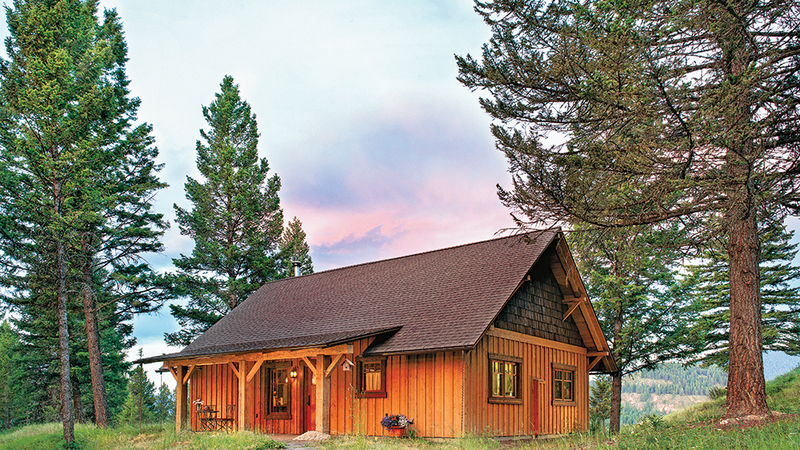 Over the years, the Lukens and their three children spent time at Glacier National Park in northwestern Montana, but it wasn’t until they happened upon nearby Whitefish in 2004 that they found a place to build their future cabin. Finding land to buy there took a little longer. After showing several plots to the Lukens, the real-estate agent brought the couple to a 12-acre parcel that had recently been taken off the market. 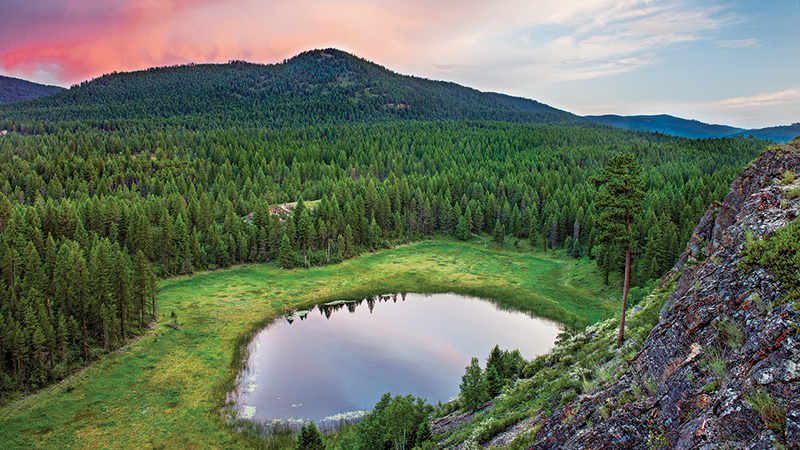 Bill and Mikki were determined to buy it, as the acreage was surrounded by state and national forest, and featured a 150-foot cliff overlooking a three-acre lake and five mountains. They worked out a deal to purchase it from the owner in two years. To help accomplish their design objectives, the Lukens shipped three semi-truckloads of reclaimed wood from two 1850s bank barn structures in Ohio that were being razed. The 962-square-foot, one-level home features a bedroom, bathroom, laundry room and an open kitchen/dining/living room. Bill retired from his horse veterinary practice in December 2011, and Mikki resigned from her position as a nursing clinical instructor shortly thereafter. They moved into their cabin full time in July 2012. Builder/General Contractor: Lee Building Co. 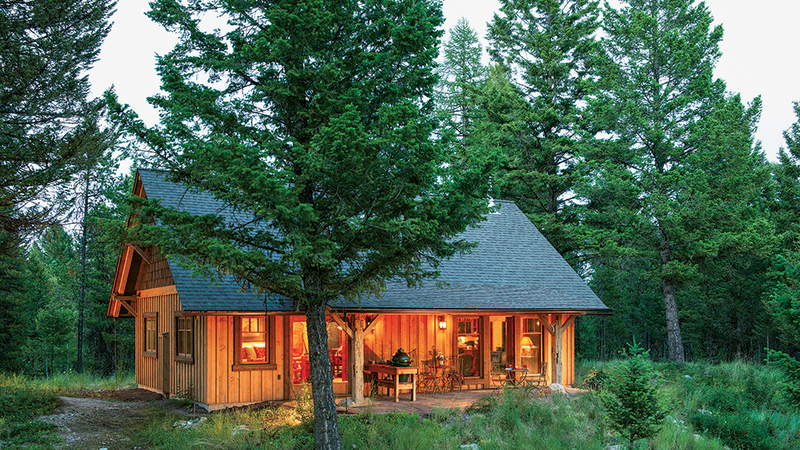 Thanks to its construction and placement on the land, the cabin appears as if it has always been amidst the trees — just as homeowners Mikki and Bill Lukens had hoped. The architect intentionally placed the home away from the driveway, with a walking path in between, to encourage anyone visiting the cabin to leave their troubles behind. 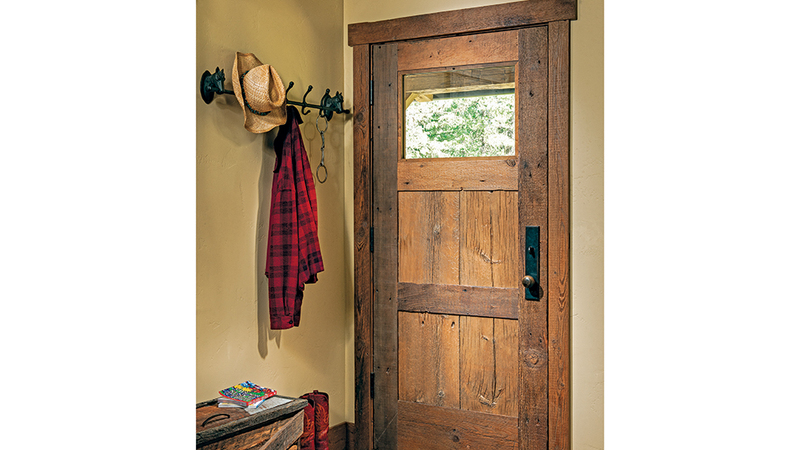 The front door features deep grooves, holes from square nails and general wear typical of wood reclaimed from a 150-year-old building. “We went with more door than window here to create that cabin look,” Bill says. A kilim rug softens the floor. Mikki had two primary objectives for the kitchen: “I wanted it to be open to the entire living room, and I wanted an island for all the cooking and baking I do,” she says. 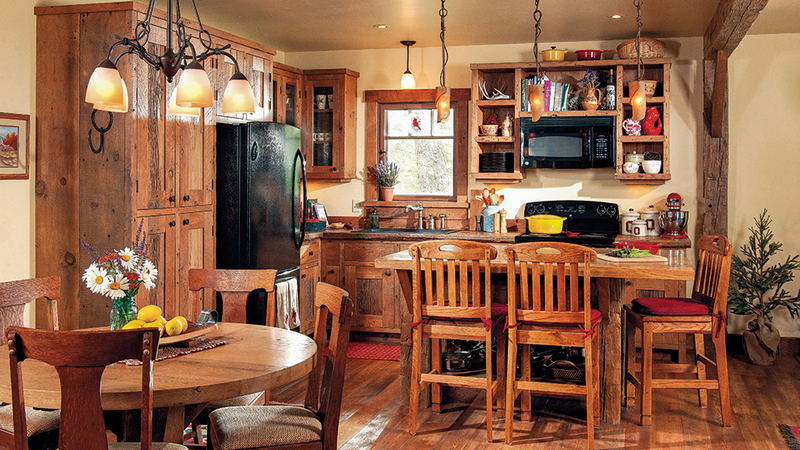 The builder constructed the cabinetry and open shelves (reminiscent of those in old cabins) out of reclaimed pine. Meanwhile, he used reclaimed oak for the island top, dining table and the post and beam that frames the division between the kitchen and living area. 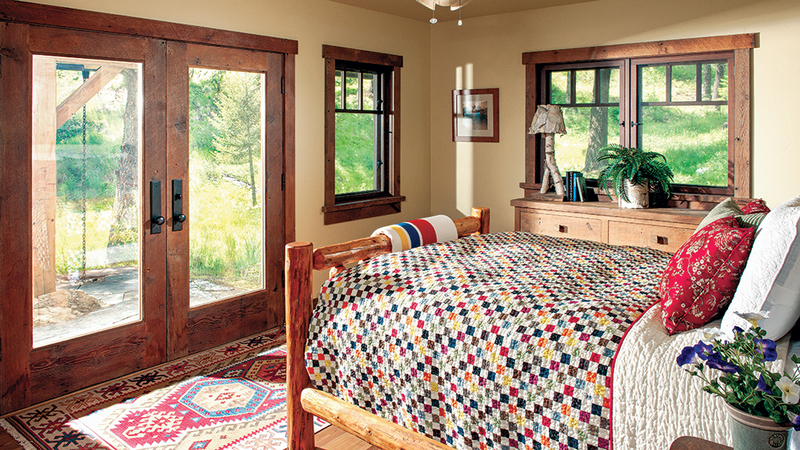 “We wanted lots of windows to enjoy the views outside the bedroom,” Mikki notes. The pine post bed complements the birch lamp, which the Lukens built from a downed tree they found on a backpacking trip. The builder constructed the doors (which open onto the back patio), windows and the reclaimed-wood dresser. 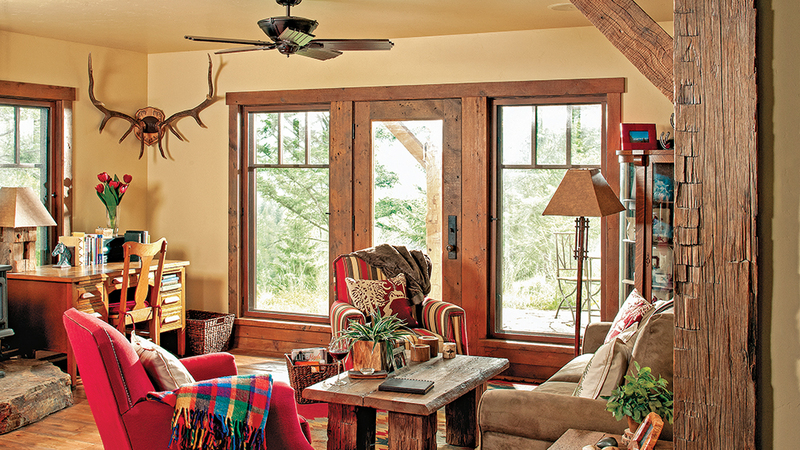 The builder used red wood from one of the dismantled barns as wainscoting. 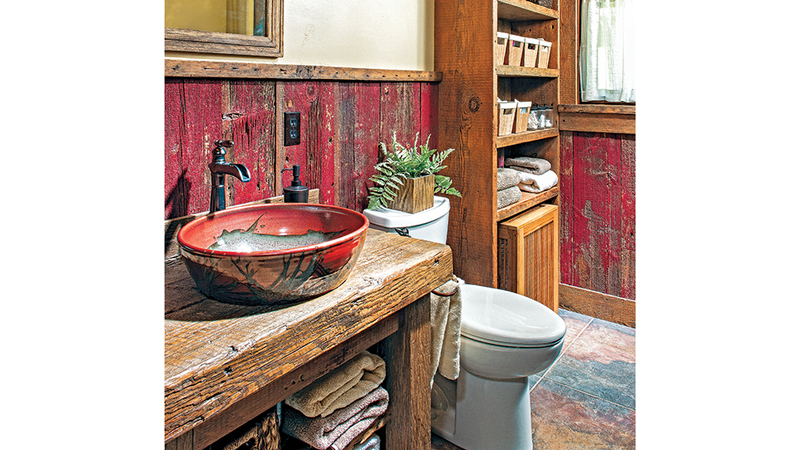 He also built the vanity and corner cabinet out of reclaimed wood. For the sink, Mikki commissioned Whitefish Pottery to create an 18-inch vessel that matched the red barn wood. A ceramic tile floor with radiant heating completes the look. 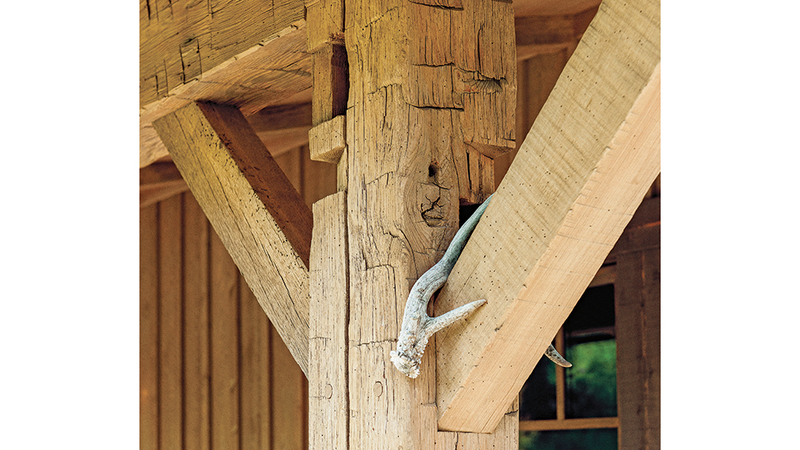 On the front patio, builder Greg Lee built three vertical columns made of reclaimed, circle-sawn eastern white pine, which is rich in character. 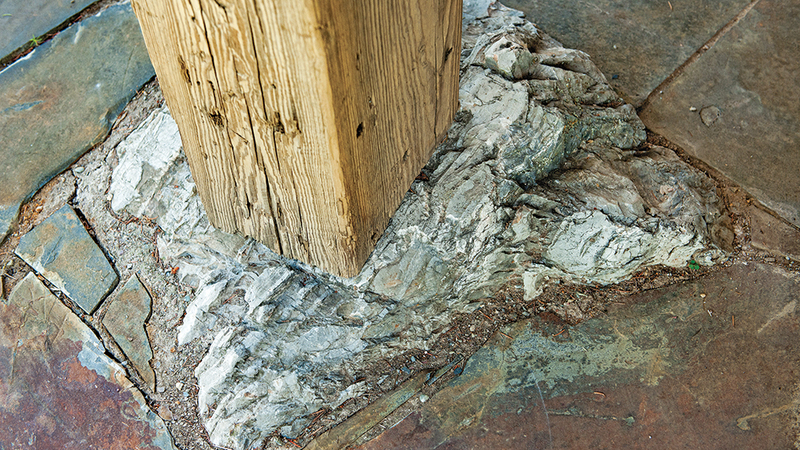 For each of the support beams on the front and back porches, the builder and his team buried large boulders in the land, then fit the posts into the top of the rock using steel pins. “It looks like the beam is growing right out of the stone,” Mikki explains. A look over the cliff reveals a three-acre lake, one-third of which belongs to the Lukens. They enjoy fishing and swimming in their section of the water. 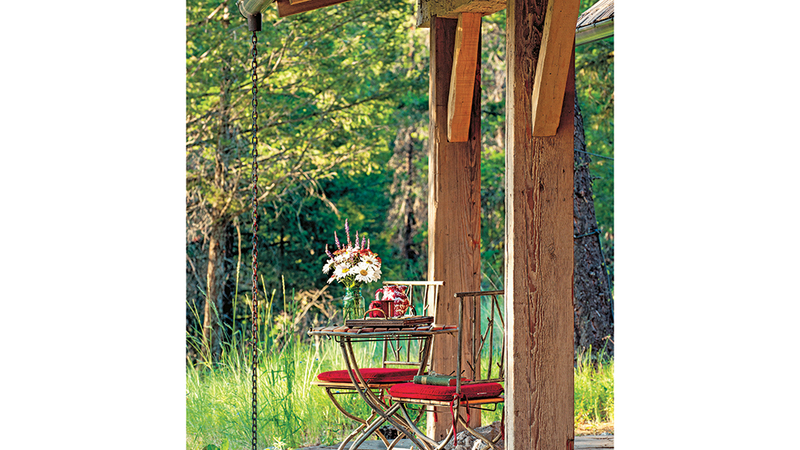 Bill and Mikki added a “rain chain” downspout to the cabin’s gutters — a detail similar to ones they had seen at old lodges.